I cannot tell a lie I am a fan of rainbow colored almost anything! Meal ideas can be difficult for us busy people during the week. You can’t always cook new different things. Sometimes all it takes is a little bit of color to add a some of pizazz to old recipes. I am also not above including edible glitter or some dust to these bad boys. 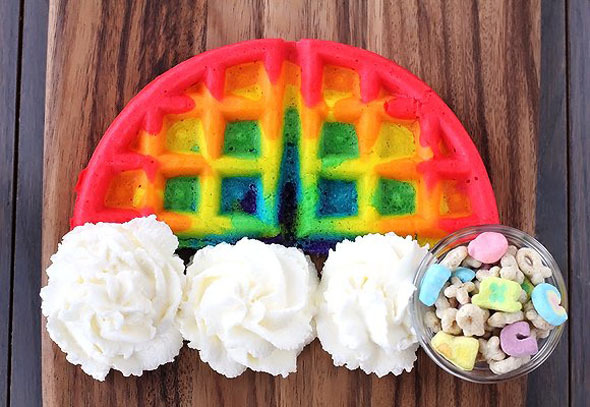 I found this idea on tablespoon.com and I had to share it because rainbow waffles are something the world should have been doing long ago! I bet waffle maker sales will sky rocket now! 1. In a large bowl, whisk together Bisquick, eggs and milk until smooth. 2. Divide the batter into six portions, around 1/3 cup each, giving a little extra to the bowls for the red and orange colors. 3. Use gel food coloring (red, orange, yellow, green, blue, purple) to color each bowl of batter to your desired vibrancy. Whisk in food coloring until evenly blended. 4.Transfer each color of batter to its own piping bag and cut off the tips (careful not to spill the batter). You can use a spoon for each color if you dont have piping bags, just be very careful. 5. Carefully pour each color into a heated circle waffle maker to make your “rainbow”, starting with red, then orange, yellow, green, blue and purple. Cook according to waffle maker instructions. 6. Remove, and repeat with remaining batter. Cut each waffle in half. 7. Serve with whipped cream for “clouds” and Lucky Charms as the “treasure” at the end of the rainbow you can also serve it a bowl of fruit or any desired cereal. Perfect little snack for the holidays! You can whip up a few quickly and have fun decorating. You can add cookie crumbs, edible glitter, cake bits anything you want to make these super cute desserts your own! This is yet another treat that would be a great party activity or even a family one. Everyone buys candy over the holidays so make it useful. Add candy canes or chocolate even! Try dipping the bugles in chocolate first and after you are finished and the cones have been made drizzle them with carmel! Have fun with it. 1. In a small mix bowl, cream butter and sugar until the mixture is light and fluffy. 2. Next beat in the salt and vanilla vanilla extract. 3. Add condensed milk and make sure to mix well (mixture will get stiff). 6. Place one ball on top of each Bugle. Dip the tops of some or all in melted chocolate if desired. 7. Decorate at your own will. I can never get enough of tacos! Finding new recipes to change up one of my favorite things makes me beyond happy. I know what you are thinking “Potato Tacos!!! Carbs Carbs Carbs!” but some carbs are beyond delicious. You can also add your favorite veggies to this recipe to make them a little different. 1. Place boil potatoes until tender but not falling apart. 2.In 10-inch skillet, heat oil over medium-high heat. 3. Add potatoes, onion and bell pepper; cook 5 to 7 minutes, stirring frequently, until onion and bell pepper, and jalepeno are crisp-tender. 4. Reduce heat to medium-low. 5. Stir in salsa verde and taco seasoning mix; cook 3 to 5 minutes, stirring occasionally. 6. Divide filling evenly into taco shells. Top each with lettuce, tomato, taco sauce and cheese. ** If you are not a fan of spicy food you can use vegetable oil for the vegettables and take out the jalapenos. I cannot get enough of Mexican inspired food. I eat many a Mexican dish regularly because I am obsessed spicy food and it is easy to change up with beans rice or vegetables! You can literally make the same dish in a variety of ways. The Black Bean Taquito recipe is super fun and I cannot wait to make them. They are quick and easy to make for a great snack for parties or even an appetizer to spice up dinner. 2.Bring medium or large pot of water to a simmer. 3.In a pan, heat oil over medium heat. Saute onion and pepper until onion becomes translucent. 4.Gradually stir in garlic, cumin, paprika, salt, and continue to cook for 1-2 more minutes. 5.Add in black beans and cilantro, cooking until beans are heated through- two to three minutes more. 6.Turn off pot of water. Taking one corn tortilla at a time, dip in hot water for 3-4 seconds. 7. Place on a cutting board and scoop one spoonful of black bean filling and a hefty pinch of cheese on top. 8.Roll tight and place seam side down on a baking sheet covered in parchment paper. 9.Repeat until all the filling is used. Brush each piece with oil. 10. Bake for 12-15 minutes until the corn tortilla is a light brown color. Feel free to dip your taquitos in any thing you want salsa, sour cream, guacamole, cheese sauce or even use a few in a salad for decoration. Brussels sprouts are one of my favorite veggies ever, then you add cheese, WHAT!!! This has got to be the best dish ever! I found this recipe and could not be any more excited. The only thing that I would be larges amounts of jalapenos and hot red pepper but I understand that isn’t everyone’s cup of tea. I also know many people may feel a certain type of way about Brussels sprouts but I promise they are worth consideration. I eat them on a regular basis. Once you get over their bad reputation I promise they are quite delish. 2. Add the garlic for the last minute. 3. Scrape the onions and garlic into a large, shallow casserole and spread them around evenly. Set aside. 4. Trim the Brussels sprouts, then cut them in half (or quarters, if very large) lengthwise. 5. Bring a large soup pot of well-salted water to a rolling boil. Add the Brussels sprouts. Return to a boil and cook for 5 minutes. 6. Drain immediately in a colander for 5 minutes. 7. Transfer to the casserole, spreading the sprouts evenly in the dish. 8. Heat the oven to 375°. 9. Combine the milk and vegetable broth in a small saucepan. 10. Bring to a simmer, then remove from the heat. 11. Meanwhile, melt the butter in a large saucepan. 12. Add the flour and cook, stirring over medium heat, for about 1 minute, until the flour is light golden brown. 13. Whisk in half of the hot milk and broth. Heat and whisk for a minute or so, until thick. 14. Add the remaining liquid and cook for about 5 minutes, whisking frequently. 15. Whisk in the Parmesan cheese, mustard, salt, thyme, and pepper. 16. Pour the sauce evenly over the Brussels sprouts. Mince the bacon and sprinkle it over the sauce. 17. Sprinkle evenly with the Cheddar cheese and dust lightly with paprika, hot red pepper flakes and jalapenos, if desired. 18. Place the casserole on the center oven rack and bake for 30 minutes, until bubbly and golden brown. 19. Cool for about 5 minutes before serving. Makes 10 servings. I love coleslaw in the summer! It is a crisp, refreshing and delish salad that goes well with a large variety of summer meals. Keeping coleslaw around is a good idea as long as you are not using an over abundance of mayo. I found this simple & quick recipe that I really want to try, it sounds mucho delish! Combine cabbages, cranberries, celery, green onions, and green pepper in a large plastic bowl with a snap-on lid. Combine all dressing ingredients, adding salt and pepper to taste, and refrigerate until ready to serve. Pour dressing over slaw just before serving. Stir well. I have to admit mozzarella sticks are one of my fave snacks on the planet. They are a classic snack for parties and get togethers. I could eat them almost everyday I think. That being said they are very not good for you. They are fried, breaded and a bunch of cheese! I found this method the other day and was pleasantly surprised at how deliciously my updated mozzarella sticks came out. 2. Place the cheese on the wrapper by the edge so you can roll up the cheese completely. Before you get to the other end of the wrapper fold in edges to seal the stick. You can use a little water to make sure the ends stick together. 3. Melt the butter (or substitute) so it can easily be brushed on to the sticks. 4. Brush the sticks lightly all around so they will get crisp. 5. Put sticks in the oven for 10 minutes and watch closely so they do not burn and so the cheese doesn’t leak out. The sizes and thickness of your wrappers and cheese will really determine how long your sticks should cook. 6. When finished remove your mozzarella sticks to a plate and add your dipping sauce. Let the sticks cool for a couple of minutes first before trying. I cut mine in half after plating. Kale is actually one of my fave leafy greens. I am not sure why but I think it has to do with the fact that I can throw a bunch into a boiling pot of water and then just snack away. It goes well with other veggie mixtures and stirfrys. I don’t think it has any particular taste but either way I am down with it. In an effort to creatively snack I decided to attempt some homemade kale chips since they are all the rage. They came out super delish I must say! 1. Preheat an oven to 350 degrees F (175 degrees C). Line a non insulated cookie sheet with parchment paper. 2. Carefully remove the leaves from the thick stems and tear into bite size pieces. 3. Wash and thoroughly dry kale with a salad spinner or paper towel. 4. Put kale pieces in a large Ziploc bag and add half of the oil first. Massage the kale gently to make sure the leaves are covered then add the rest of the oil. 5. Add the vinegar and sea salt. Massage the leaves gently until they are covered with the mixture. 6.Bake until the edges brown but are not burnt, 15 to 25 minutes or until desired crispiness.